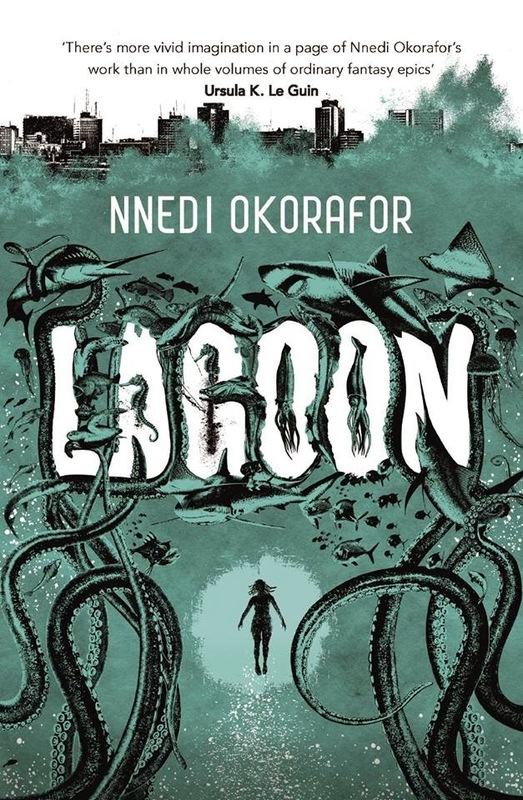 Back in April I wrote that Nnedi Okorafor, author of Zahrah the Windseeker, Who Fears Death and Akata Witch next novel Lagoon would be published March 2014 - although now I think it might be next April. Well, a few days ago Nnedi Okorafor shared the gorgeousness that is the book cover on her blog - Nnedi's Wahala Zone. Designed by award-winning South African illustrator and designer, Joey Hi-Fi, this cover is absolutely gorgeous. Lagos above and all the life and activity under the sea, how tentacles have been used in the outline of LAGOON and the creatures everywhere and in between the title. I want to know what's going on, what's going to happen, especially with that person at the bottom of the sea.The cover is both daunting and fascinating. I love it! I fell head over heels for the UK cover of Zoo City (black and white), as well as the UK, US, SA and international edition of Moxyland which Joey Hi-Fi did. Then I saw Jungle Jim 16, the South African Sci-Fi edition. Earlier this year were the SA covers of The Shining Girls ... and now this!!! This judger of book covers is extremely happy. While we wait for Lagoon, hope you enjoy this cover as much as I do. Then when you're done, get lost in Joey Hi-Fi's amazing work here. Great Cover!Nnedi actually spotlighted you on her facebook, I'm glad she did or else I would have never known about your awesome blog!!! Great cover. Can't wait for the book to come out. Thanks for posting.